YUK BALLS: a cri de coeur. The Brussels Sprout: a cry for help. I have never met a brussels sprout I liked. I know brussels sprouts are supposed to be good for you being chocka block full of anti-oxidants, minerals, vitamins and having no negative impact in terms of fats and cholesterol. They just taste ‘erky-perky’! Brussels sprouts have been forever known in our household as yuk balls. As children, my sister and I would howl the place down when confronted with a bowl of brussels sprouts as being the green vegetable to be consumed as part of the evening meal. Please note that I use the word confronted rather than presented. I describe the vegetable as green advisedly, as it was so overcooked that the only way Bet, my mother, could keep said vegetable green was with the liberal application of bicarbonate of soda. Bet was a powerhouse. She was a dynamic, unique, engaging, uncompromising woman of integrity who encouraged my sister and I to believe that we could be anything that we wanted to be at a time when that was decidedly unfashionable. Cooking, however, was not her long suit. So I have spent all my adult life avoiding yuk balls. These miniature cabbage balls of bitterness sit in the F & V section of my supermarket daring me to play with them. For four decades I have avoided taking on the challenge. I wrote this before I started to tweet. Since then I’ve developed a friendship with a number of the artwiculati who are also foodies. A discussion arose about brussels sprouts, and it quickly divided into those who, like me, gag at the mere thought of yuk balls for dinner, and those who love them. Recipes and methods of cooking sprouts were offered up as examples. Here they are. Feel free to add to the list and discussion. Vivienne is a very talented and much loved member of the artwiculati. She seems to have endless time and patience with those of us who still don’t know what the hell we’re doing. To be “mwahed” by @vivchook brings a smile to the dial. Here are her suggestions. Roast for 40 mins @ 190C (I’m assuming this is a conventional oven, minus 10C if fan forced). Vivienne also suggested cutting a cross in the base of the sprout, inserting the sliver of garlic and then standing the base of the sprout in a pool of balsamic vinegar for an hour or two. Silia is the numero uno of artwiculati players. She is seriously brilliant in her command and manipulation of language. She plays with words like a sculptor would play with plastercine. She tempers her brilliance with being one of the nicest people with whom you can chat about anything. Like Ms Chook, Silia makes you feel welcome. Silia suggests roasting the sprouts in the oven and topping them with shaved Parmigiano. 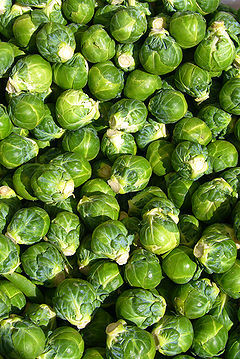 Posted in Food, Politics, Sport, Kitchen, Recipes and tagged #yukballs, brussel sprouts, brussels sprouts. Bookmark the permalink.